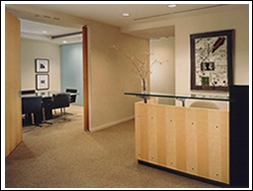 Johnson and Colmar is a smaller law firm that combines large-firm capability with small-firm sensibility and respect for the client. Our practice is focused on business law, concentrating on business planning, acquisitions, litigation, corporate finance and securities law, and on municipal law. Our clients include service, manufacturing and professional businesses ranging in size from start-up ventures to substantial public companies. We also represent municipalities and other units of local government and prominent local charities. In addition, we serve as local counsel for a number of out-of-state companies. We believe in providing legal services of a quality equal to that frequently available only from far larger firms but in doing so at a much more modest cost. We are committed to competing with any firm in the quality of our work while at the same time pricing our services in a manner that reflects the competitive nature of the legal marketplace and our appreciation of the desire of all clients to incur legal fees only for efficient and effective service. Our size – and hence our flexibility – and our experience have made us an attractive choice in corporate governance situations where special counsel is required for rapid responses in discrete engagements. bring disputes and negotiations to a close. In short, we believe that the legal tail should never wag the business dog.